A mild almost sweetish broth with some unobtrusive rice noodles makes for a quick and inexpensive lunch. The only problem is the 1340 mg of sodium (salt) per bowl. But still, not bad for 99 cents. How does it compare to the ubiquitous cup of ramen noodles. There is no comparison for taste. TJ’s rice noodle bowl is hands down better than the traditional cup of ramen noodles. Even though the least expensive ramen noodles are about 33 cents a cup, there’s still no comparison. Most of us can afford the extra 66 cents to enjoy something that’s much more enjoyable to eat. The package says there are two servings per package/container/bowl. Most of us would consider the container to be just one serving. The calories and salt listed here assume one person will eat the entire contents. Most of the cost of the noodles has to be in the packaging. It’s sort of a do it yourself, almost Lego-like, experience. This package came with the rice noodles already in the bowl. But with not less than three packets to break open and add to the bowl before “cooking”. Included was; a packet of oil (maybe just a half teaspoon), a packet of dried greens (spring onion and garlic flakes) and the secret salt-laden packet of seasoning (not so much of a secret as the cardboard wrapper lists it all out. Follow the directions. Partially peel back the “lid” on the bowl, cut open and add the packets, pour in boiling water to the first line in the bowl (or fill with cold water and microwave three minutes), let sit 3 minutes, stir and eat. It’s going to be hot after 3 minutes, so maybe wait a little longer for it to cool down a bit. 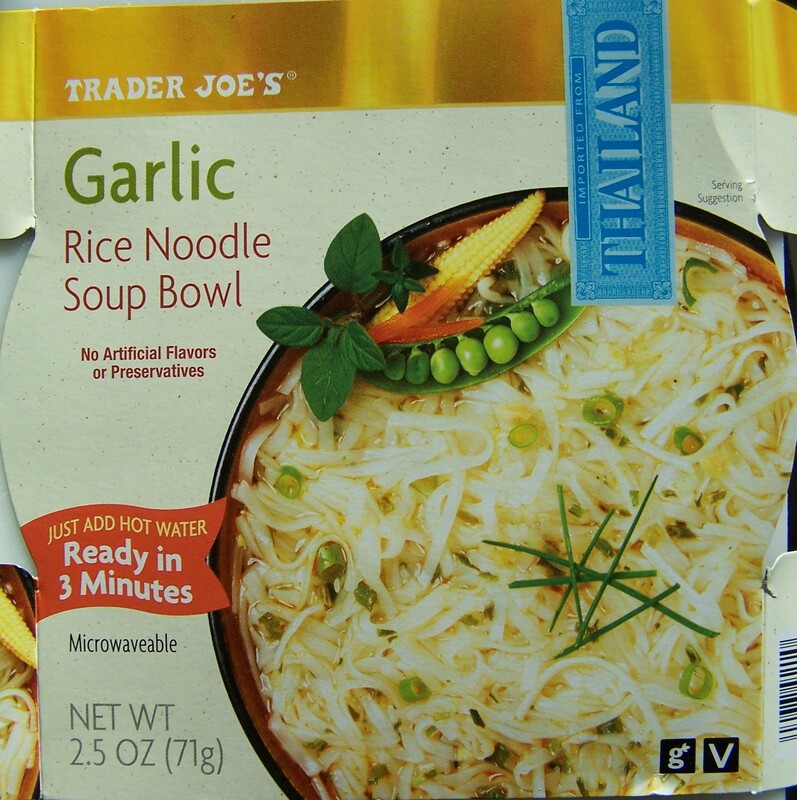 This entry was posted on 04/09/2011 at 19:28 and is filed under Recipes, food, cooking and related items, Trader Joe's, Vegetarian. You can follow any responses to this entry through the RSS 2.0 feed. You can leave a response, or trackback from your own site.